The Funding Network - Proof that philanthropy is for everyone! News : TFN in the media : Proof that philanthropy is for everyone! Proof that philanthropy is for everyone! Last Tuesday night The Funding Network held its second live, collective-funding event in Perth at the Commonwealth Bank offices in Murray Street and in just 30 minutes Western Australians pooled small donations reaching over $40,000. TFN is an Australian non-profit organisation and part of a global network that makes it possible for individuals from all walks of life to give (in increments starting from as little as $100) with the objective of raising at least $10,000 for individual community benefit projects. The evening started with an inspirational recital of the poem ‘Living and Giving’ by 11 year old Millie Higgins, TFN’s youngest member. Four pitches followed from grass-roots non-profits who held the 100-strong audience’s close attention as the passionate entrepreneurs told stories of adversity, courage and triumph. Miracle Babies, an organisation that supports the families of over 3,000 WA premature and sick newborns each year received $10,000 for NICU Survival Packs (neonatal intensive care unit). Zero2hero who provide school-based mental-health and awareness programs for 50,000 young people in 60 schools around WA each year received $10,500. The money will help fund their five-day mental health leadership program - ‘Camp Hero’. Night Hoops who run basketball tournaments with the objective of diverting youth (aged 12-18 years) from anti-social behaviour in the Fremantle Cockburn area secured $10,050. Allowing them to continue their work of providing life skills, education, deliver health messages, tolerance and recognition through the promotion of music, dance and performing arts in remote Western Australian Indigenous communities, Desert Feet Tour received $10,000 funding. The goal of TFN is to help democratize giving. This was exemplified my a magic moment when a young man stood up in the crowd and pledge a week’s wages to support Desert Feet. 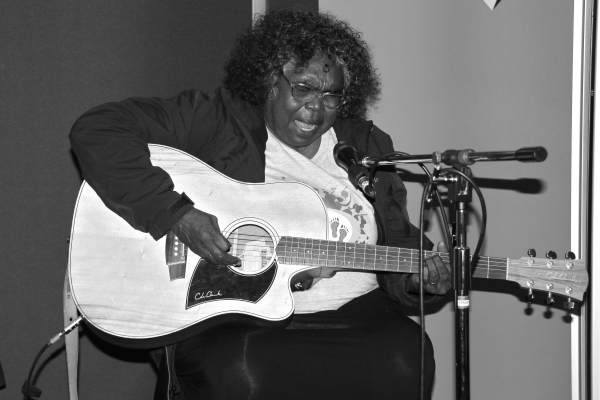 The evening concluded with stirring performance by Desert Feet Inc Honourary Lifetime Member and Aboriginal Gospel Blues singer Olive Kankawa Nagarra Knight, whose credentials include singing on Broadway with Hugh Jackman. And TFN is not just about facilitating funding. It’s also about directing talent and resources to the right projects, creating momentum and becoming the maker of opportunities. If you want to be part of The Funding Network or attend the next event, visit www.thefundingnetwork.com.au for more information. The event was generously hosted by the Commonwealth Bank in Perth on November 18, 2014. We are hosting one more event in 2014. Tickets are available now.